Whenever I read the term 'forced rhubarb', I get a picture in my head of an unruly pink stalk wriggling around like an eel as a farmer tries to cram it into a veg box. 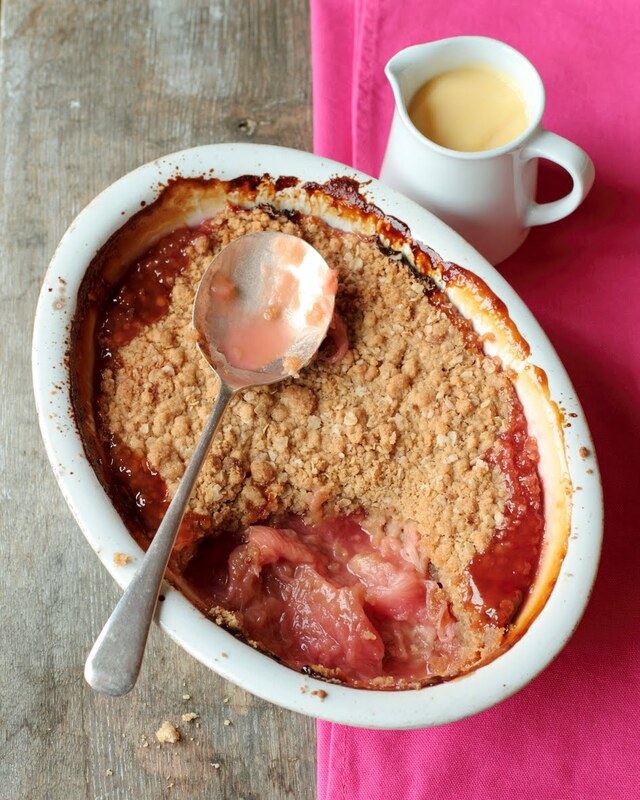 Anyway, it's in season now, and there's nothing better on a dark winter night than a rhubarb crumble served with rivers of thick custard. Heat the oven to 200C/180C fan/gas 6. Cut the rhubarb into thumb-sized pieces, then transfer into a saucepan with the ginger, honey, a splash of water and 100g of the sugar. Simmer on a medium heat until the sugar has melted and the rhubarb has softened slightly. Take of the heat and pour into an oven proof dish. To make the crumble topping, sieve the flour into a mixing bowl with the cinnamon, add the remaining 50g sugar and grate the butter in (or chop it into small cubes, it just makes it a bit easier to work with). Use your fingertips and to rub everything together, it takes a bit of time but you should end up with a coarse, breadcrumb-like mix. Stir in the porridge oats then scatter on top of the rhubarb. Bake for approx. 30 mins until golden. How I wish I could find rhubarb here in Tuscany!